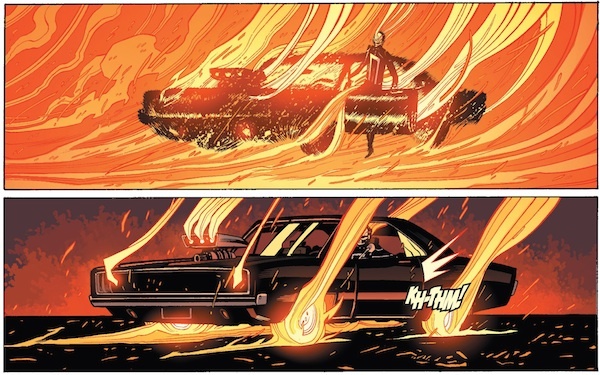 When I found out that Tradd Moore was going to be pencilling the All New Ghost Rider, I knew I would be buying it. The first issue was released last week and it did not disappoint with its frenetic energy and its super charged car chases. I am by no means a Ghost Rider loyalist and take little issue with the transition from bike to car, as long as it is done well and faithfully. 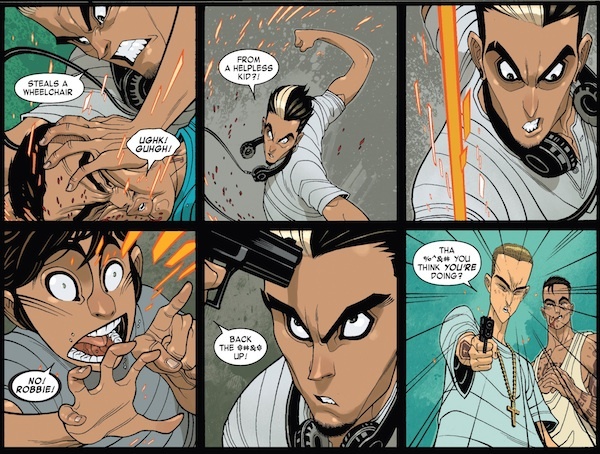 Tradd Moore has developed his popularity from the Legend of Luther Strode, which was an ultra violent angst ridden romance story. The art was suitably exaggerative in execution and punishment but not in gratuitousness. The application of this skill was what I was looking forward to most with the new book. From the get-go there is a style and theme to the book and the title page is quite apt and reminiscent of the Fast and Furious movies. The font is streamlined and slick with angulations, appreciating the effects of speed. The colouring is a lovely touch and the rev counter has the needle at full in the midst of Hell. 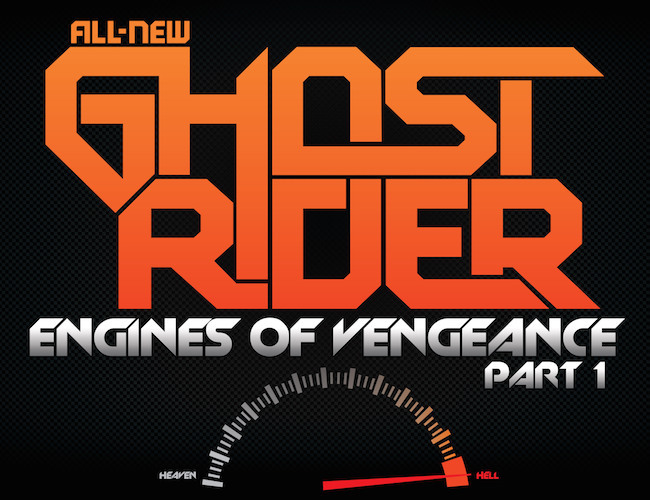 The spirit of vengeance is entering the race and Robbie Reyes is there to meet it. The book plays to Moore’s strengths as we start with some nicely portrayed scenes of violence. As Reyes defends his disabled brother we can see some great scenes of defiance and anger. The panels move in sequence telling the tale of the fight. We see Robbie extremely physical and almost follow his punch into the guys face, but then his little brother expression is one of fear as a gun is pointed towards his hero’s face. The eyes tell the story and Tradd uses focus lines to draw your attention to the assailants threatening visage. Not only does this greet us with trepidation but also fear. During the fight scenes the art becomes quite accentuated as the physical expression of violence brings out the dramatic furrowed eyebrows, the longer hyperextended limbs and the eyes almost pop out his brother’s head. These are great effects that amplify the intensity at hand. These touches are less utilised with the car chase scenes, but Tradd and his colourists Daniel and Staples bring out the fervour with a different tact. The solid machines are less amenable to elaboration but the effects of their speed are not. The lighting effects sell the scenes as the headlights are drawn as lines brings attention to the speed they are doing. It is not only that but there are literally sparks flying from the wheels of the cars. This may not be realistic but it looks great, especially when you are able to bring additional colours to the panel. The contest is at night which means you are able to utilise different lights to brighten the scene and accentuate the speed. The use of momentum lines also adds to the effect as we seen the road and sky brimming with velocity. The reflections on the windows and helmet are also a nice touch. By far my favourite aspects of these scenes are the smoke clouds billowing out from the rear of the vehicles. Not only do they provide a sense of direction but also of the sheer determination of the car to turn at speed, especially when in pursuit by the police. I adore how the smoke cloud becomes rougher and larger the further it moves from the car. Now if we then bring in the Ghost Rider possession then you can imagine where Tradd takes the artwork. There is a huge explosion of light on Reyes and on the car. The automobile lights up with some glorious blurring effects emulating a fire, which then settles to a energy expelling roar from the exhausts and tires. It is a natural continuation of the race scenes. The tyres glowing yellow and red is such an impressive effect. Now if we look at Robbie we can combine the emphatic physical gestures and glorious colouring to bring about the all new Ghost Rider. The curved and bendy arms and crooked fingers bring about a sinister appearance, let alone his almost schematic skull face. 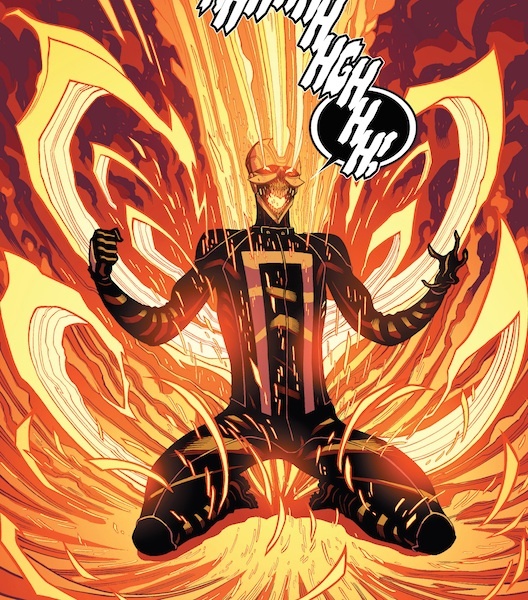 The blackness of his outfit is superbly contrasted by the flames emanating from him. The yellows and oranges of the curved flames demonstrate the unpredictability of fire and of the spirit itself. The head being the most illuminating develops the character further as a powerful being and not just a man on fire. 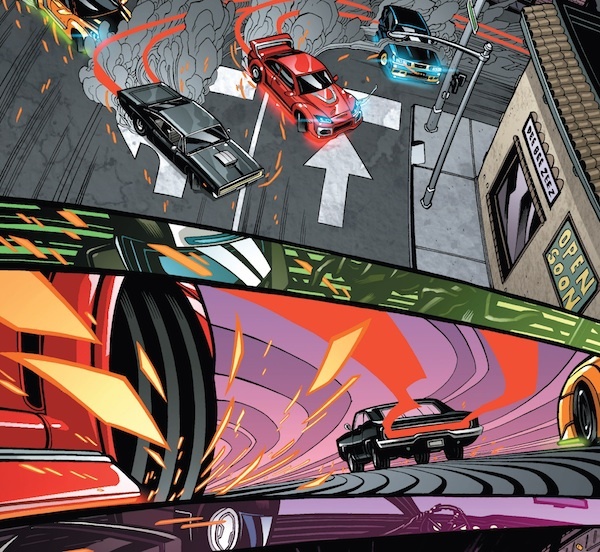 I really enjoyed this book because the pencils and colours are so vibrant that the energy lifts from the page as the cars whizz and the Ghost Rider comes to life. The plot will develop sure enough but Tradd Moore will bring it to fruition and if it is as energetic as this first issue then we have a wonderful book ahead of us.